According to a report by CBC News, Toronto drivers have been using the city’s King Street pilot project discount code to park for free downtown, for hours well beyond what’s allowed by the $10 promo code. “Recent reports on usage of the promotion code indicate a very small number of customers have used the code more than once per day,” confirmed city spokesperson Bruce Hawkins. 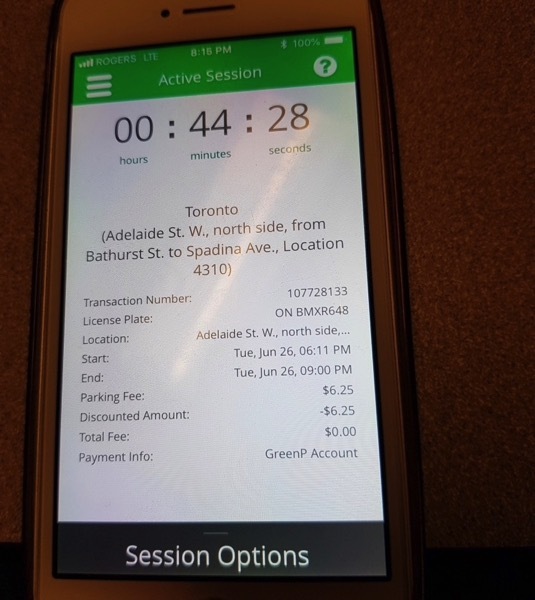 He added that since learning of issues with the app, the city has updated the app to only allow customers to use the discount code once every 12 hours. Hawkins said usage data on the discount code will be released publicly in the next round of King Street numbers, which is targeted for Friday. It’s not currently clear how many app users used the discount code repeatedly since it was announced six months ago, or how much revenue the city may have lost through this practice during that time. The city has also made changes to its online promotional materials, and has updated the web page outlining the King Street parking promotion to read, “The code can be used only once per customer per day”. When asked about customers’ repeated use of the city’s discount code, Mayor John Tory called the practice “disappointing” and likened it to using the TTC without paying. Back in November, the city launched the King Street Pilot Project in an effort to speed up streetcar service on the TTC’s busiest surface route by limiting car and truck traffic between Jarvis Street and Bathurst Street. However, area businesses have staged multiple protests since then, saying it’s having a negative impact on sales.